Here in California, a large and boisterous crowd gathered in front of San Francisco City Hall to push back on the myriad attacks on working people and our families. When unions are strong, our working class is strong, and the workers of today rejected the heinous decision during the call to action. 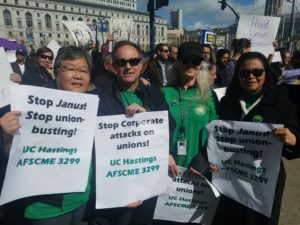 Nancy Reiko Kato, UC Hastings, AFSCME 3299: We organized to take a stand against Janus, which is about union busting. We are public employees! We believe in our union because we know that the union provides us protection to allow us to stand against the bosses and administration. Unions are vital parts of our communities and are critical to ensuring things like public education remain affordable and accessible to all. Tim Killikelly, City College of San Francisco, AFT 2121: I am here to defend the rights of all working people to have a union so that we can be strong enough and powerful enough so that we can get the things that working people deserve. Fair wages, a place to live, decent healthcare, decent pensions, these are the basic necessities that all working people should have. The people that are trying to fight us are acting as if our requests are illegitimate for unions to ask for people to pay their fair share for representation. I love my union for many reasons. We helped bring free city college to every San Francisco resident. We helped save our city colleges in San Francisco during the accreditation crisis. I love unions because of their dedication and earnestness. Lita Blanc, United Educators of San Francisco, Local 61: I’m here today because I believe unions are essential for working people from coast to coast. Unions are essential to the defense of quality public school education. Without our union, educators would not have a fair evaluation system, our students wouldn’t have class size limits which allow them to get the best education, and we would not have ratios for counselors and nurses to support the students. I love my union because it gives us a collective voice. We have 6,200 members of classroom teachers, teacher assistants, security, family liaisons, librarians, school nurses, and counselors. We all stand together when it comes to defending the rights of our students’ education and also our rights as workers on the job. 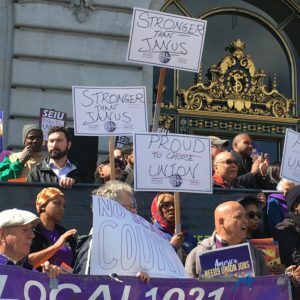 Among those rallying support for the workers was San Francisco Mayor Mark Farrell, Supervisor Jane Kim, and former Senator Mark Leno. Similar events occurred in San Diego, Los Angeles, Fresno, Bakersfield, Monterey, and Sacramento. No matter what happens with the Janus v AFSCME decision, thousands of Californians made it crystal clear today that standing together in our unions is as critical to our future as it’s been to our past and we aren’t about ready to let the corporate billionaires and the politicians they bankroll take away our freedoms.